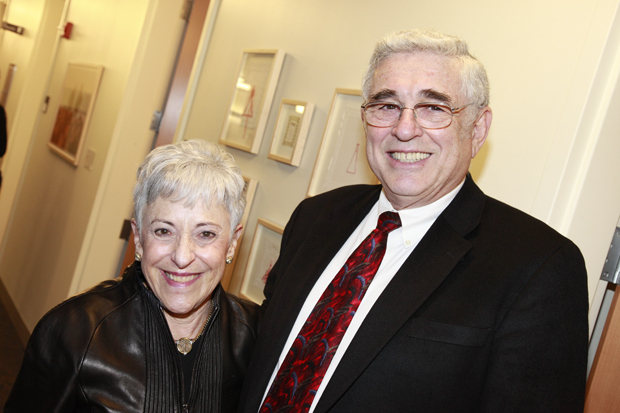 The new home of the Schusterman Center for Israel Studies, in the Mandel Center for the Humanities, was dedicated Wednesday with an art installation, statements of pride and hope for the future – and a sober warning from the center’s principal benefactor, Lynn Schusterman, about the international campaign to delegitimize the State of Israel. This campaign, Schusterman said, is attempting to undermine the state’s right to exist and to demonize and isolate it through boycott, divestment and sanctions. “It is an effort that occurs daily in university classrooms, on campuses, in media outlets, in parliaments across the world, in the chambers of the United Nations and elsewhere,” Schusterman said. “It fills me with despair to think of how disastrous these attacks could prove for Israel. “I believe that education is key to countering them and to building understanding of Israel in all its richness and complexity,” Schusterman declared. “The Schusterman Institute for Israel Studies at Brandeis is, and must remain, at the vanguard of building this knowledge through promoting exemplary teaching and scholarship about modern Israel. “We must lead the way in countering the darkness of lies, distortions and misinformation with the light of better facts, deeper knowledge and firsthand experience,” she said. President Jehuda Reinharz praised the work of the Schusterman Center, which has been in operation for two years, and the Summer Institute for Israel Studies, which predated the center and was built on the strengths of existing faculty, courses and programs in the study of Zionism and Israel at Brandeis. The Summer Institute, Reinharz said, has trained more than 140 faculty worldwide, who have introduced and developed more than 150 courses on their campuses and reached over 3,500 students. Reinharz said the center’s monthly graduate seminar has become a regional hub for Israel Studies, and that its support of post-doctoral researchers and visiting faculty have enabled numerous departments of Brandeis to offer courses in Israeli anthropology, art, sociology, politics and Jewish political thought. Both Schusterman and Reinharz celebrated the fact that the first-ever chair in Israeli art – held by Professor Gannit Ankori -- was being inaugurated as part of the dedication ceremonies. Ankori has been a visiting professor at Brandeis since 2008. In honor of the dedication, Israeli artist Nelly Agassi, assisted by Brandeis students, created a symbolic performative installation of ribbons in the auditorium where the dedication talks were delivered. At a reception later in the center's fourth-floor quarters, a collection of additional art by Agassi and other Israeli artists was unveiled.